I can't remember the last time we had a white Christmas, but we sure got one this year! 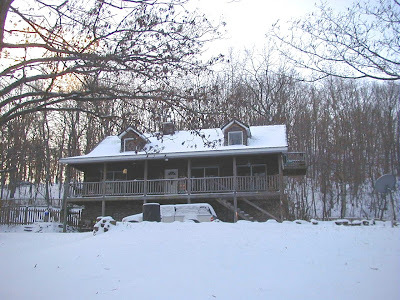 Jim took this photo this morning about 8:30, the sun isn't quite up over the hill to the left of the house, we never see a sunrise or set around here because of all the hills. Nosey Parker was out in her very first snow this morning, but we couldn't see her, either! lol Perfect camo, that girl has! It rained off and on all day yesterday and started turning to sleet last night about 8 PM, when it got cold enough. Then it became flurries and then full-fledged snowflakes. We ended up getting 4-5" of it, enough to keep my parents home today instead of coming over for a prime rib dinner. We decided to postpone that until tomorrow, just to be on the safe side. 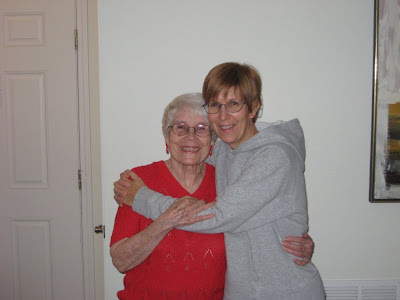 And speaking of parents, the Mumster turned 89 on Tuesday, the 22nd. Isn't she cute? And my big win came from Scotland! 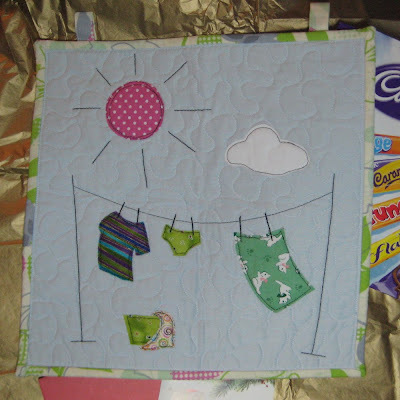 Lynz of DOMESTIC LIGHT and MAGIC made me this sweet little quilt/wall-hanging of laundry on a line. I just love it, can you see how sweet it is? I love everything about it, right down to the little scrap of fabric spilling out of the basket. I thought I'd hang it in the laundry room but I wouldn't see it very much, so I think it's going into the craft room, instead! Also, a wonderful assortment box of Cadbury chocolates, oh, MAN! These are yummy. I'm letting Jim help me with it, but only because it's the season of giving, otherwise, I'd have hidden them away and snarfed 'em all myself! Some of these chocolates are new and unknown to us, so it's kind of an adventure. We share each piece so we can both try them all. You're a real sweetie, Lynz, to send me all this, no matter WHAT everyone else says! Thank you so much, Lynz, you're a great pal and a terrific sport and I enjoyed your slightly fixed giveaway contest immensely! lol You are such a nut! I'm just so thankful that my name is Susan and I have a ickle white kitten and live in ArKINGsaw with the kitten fishers! Phew, what WERE the odds of meeting all that criteria? Huge, I'm sure! Lucky, LUCKY me! Merry Christmas to everyone, I hope you're all having a wonderful fun day with friends and family! We're staying home and warm by the woodstove today, it's cozy and quiet and a popcorn kind of day! Perfect. Enjoy! Merry merry Susan, Woody and the furrykids! I can't believe all the snow you got!! Of course here in So.California it's the usual for Christmas day. It's going to be around 68-70, sunny and almost like any other day of December. I'm not really complaining too much, but my dream is to spend just one winter season where it snows! I'd love to see an honest to goodness "white Christmas" just once in my life. Of course I want all the fun stuff to go with it...hot toddies, goodies to eat by the fire and a nice warm quilt to snuggle in. But for now I'll enjoy living through people like you and yours!! Your Mums is a doll and you two are both beautiful together!! Give NP a warm place to nap, scratch and pet all the rest of the furry family and wish Woody a "Merry merry" for me. Thank you Susan for your beautiful Blog and your friendship through the cyber-miles. You have made my life better this year!! Love the wall hanging you 'won' Susan! Hope you had a nice cozy Christmas inside.I'll bet your white kitten didn't stay out too long in the snow. Lynz did a great job with the wall hanging! Congratulations on the 'win' LOL. 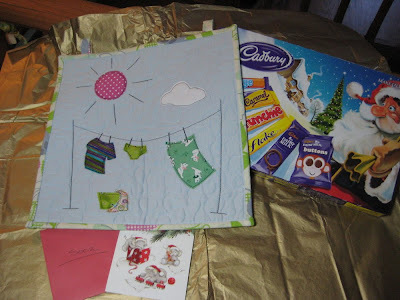 And so pleased you love the British Cadbury's experience, all my faves are there! Congratulations on your win what were the chances!!!! Your mom is too cute. Have a great holiday and enjoy the snow. It just rained all day here. Great picture of you and your Mom!! Love the smiles. We got only the lightest dusting of snow but had a great Christmas. How did I miss this?!?!? We, too, had a white Christmas (first for years!) and bikes and rollerblades are hard to go in the snow! I'm glad you like your wee wall hanging. I liked the pants myself. *grins* Your wee Ma looks brilliant! I'm so glad she's getting some relief with her medication - she dunt look 89, I tell ya!! Great presents from Lynz and lucky lucky you that you won! What are the odds....lol! Your mum looks very sweet and a great pic of you two together! I am glad she is doing so well, it's marvellous you are living so close! and LOVE your house! Must be so nice to be lovely and high in your lounge! Oh, the Mumster is positively radiant! I love the picture of you two together.....the only thing missing is.....ME! LOL She looks like she is feeling terrific and I'm so glad of that. She is an absolute delight. And I agree with Lynz, she dunt look 89 at all! You are making me so homesick with the picture of your house! I feel like putting little arrows and saying "My room" "Your Craft Room" "Way up high balcony" "Your office" and that place waaaaaaaay over on the left side on the verandah....that's my most favorite place to sit and have coffee"! (only not in THIS weather! You know I'd be inside, in close proximity to the wood stove!!) Yep, I'd have little arrows alllll over your picture!